The switch to a Monthy - Screenshots Thread, seems to be a huge success. Keep up the good work and keep posting your Linux OS Desktop Screenshots. I know it's kinda unorthodox...but I put Compiz in LXDE along with Emerald. Another screenshot of my Linux Mint 12 KDE desktop..
colyn wrote: Another screenshot of my Linux Mint 12 KDE desktop..
Nice desk, colyn. I keep wishing I could have such a clean desktop but I can't bring myself to dump some plasmoids, no matter how seldom I actually use them. Love that wallpaper, even though I wouldn't use it myself. I'm trying to keep my desktop mostly blue, although yesterday I realized I needed to activate the Mardi Gras walls in my rotation. In fact I need to see about taking some new shots tomorrow for the new month's thread. BostonPeng wrote: Nice desk, colyn. I keep wishing I could have such a clean desktop but I can't bring myself to dump some plasmoids, no matter how seldom I actually use them. I try to keep the desktop free of extra items to avoid confusion.. I like colors more than solids for my desktop. I guess that is the artist in me since I've studied art most of my life and am a photographer.. I've been going through a few of my photos to see if any would go as wallpaper..
My simple 1024x600 netbook desktop... Mint12, but running XFCE with no panel, and cairo-dock. Last edited by JoeInMN on Tue Feb 07, 2012 10:11 pm, edited 1 time in total. Here's my Tron themed Mint desktop, and Compiz sphere setup. Mint-10 main edition. Azenis theme & icons. 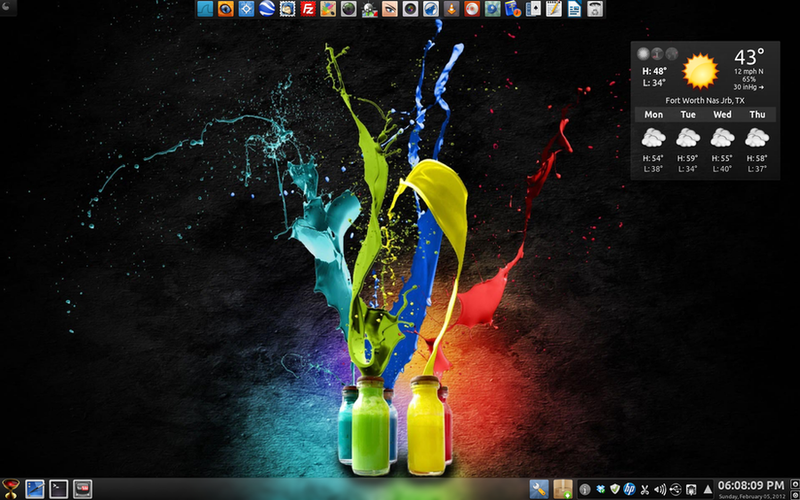 Conky with simple (but colorful) tweaks. Even though I'm running the GNOME DE I used the KDE Mint logo on the cube caps because the blue color fit my theme better. I made the caps using the Tron data disk as a base then added my own touches. Like my Compiz config from last month, I made transparent rings in the caps that I think look pretty cool. The cube gears are turning inside, so it really looks much better in motion (maybe I should make a video). I've also been playing with #!CrunchBang Linux lately, so here's some wallpapers I made for my desktop PC & Netbook. CrunchBang is not as elegant or user friendly as Mint, but it is WICKED fast! It's actually pretty intuitive and faster to use once you get the hang of the interface. It's Debian based with the OpenBox WM. You do have to do a bit more setup manually, like adding new stuff you install to the menu, but it comes with easy editors for most things you'll need to change. The #! installer is brilliant! It's cool how it keeps the image size CD small, but still lets you install a loaded OS if you want to. 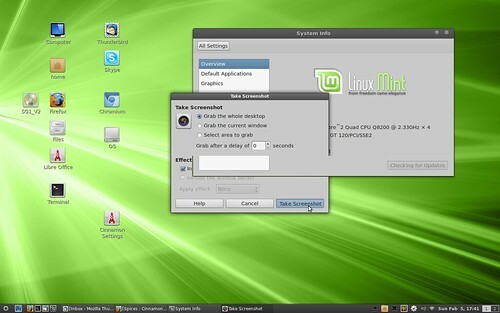 Overall Mint will be more familiar to early Winblows > Linux converts. Those of you that are comfortable with Linux really should give #! a try. The speed will literally blow you away! One quirk with CrunchBang is that it installs the 486 (single core, non-SMP) kernel by default (and it's still fast). Most users will want to switch to the 686-pae (SMP) or AMD64 kernel for best performance.